These are aztec brownies, which means they have a little kick to them which I thought was appropriate considering the cooking method. If you dont like spicy food, or are just a boring old traditionalist then feel free to leave them out, but I promise you it isnt overpowering. Ok, time to start your grill. I used 3/4 of a chimney of pure hardwood charcoal and made a fire in half of the Weber 22 inch grill. 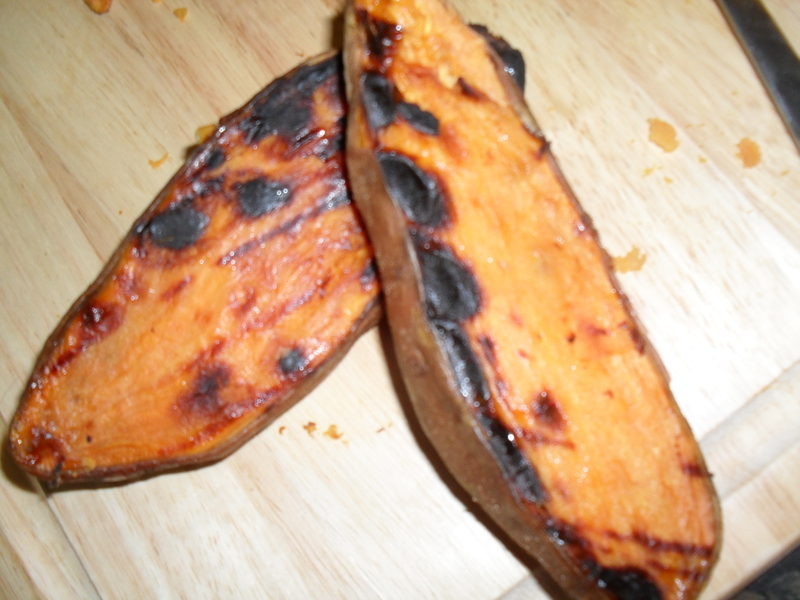 Slice your sweet potatoes in half and brush them with olive oil, then throw ’em on the grill, I cooked mine off to the side of the direct flame so they wouldn’t totally burn. Just cook them until they “give” on the sides, even if you are an amateur cook you can squeeze a tater and tell if it is done. Feel free to start making your batter while your taters are cooking, takes about 20-25 minutes. 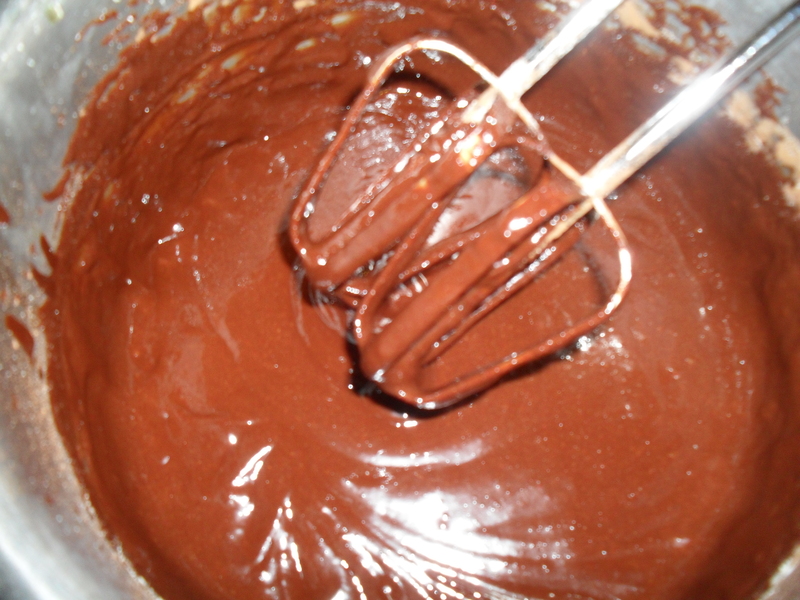 Melt the chocolate bar and the butter together, then whisk them with the other wet ingredients. I strongly recommend having an electric mixer here unless you want a really good upper body workout. After you incorporate all of your dry ingredients, except for the chocolate chips, and mix some more, you can get started on your sweet potatoes. If you’re smart, and I am not, you will wait until they have cooled completely to try to scrape the flesh away from the skin, but I was in a hurry. 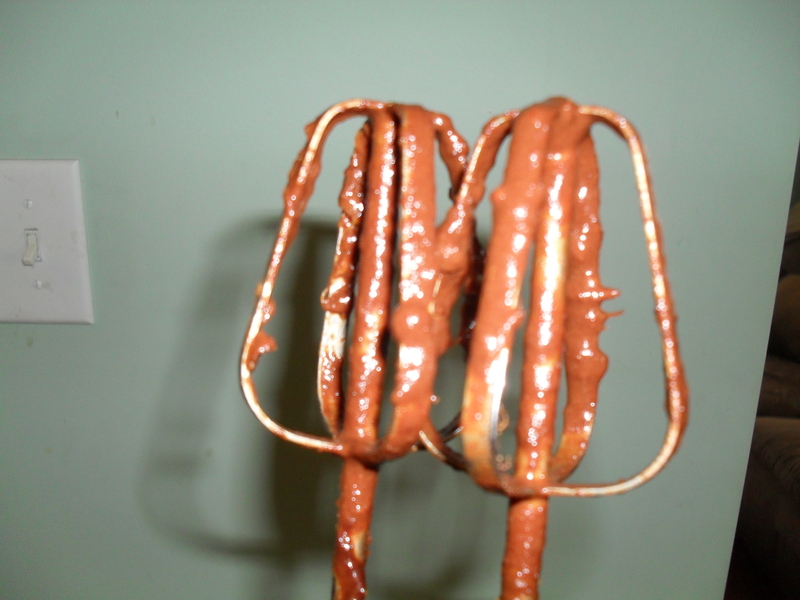 I put my sweet potato flesh and my batter mixture into a Ninja, but you can use a blender or food processor. This gets all the chunks out…super duper important! 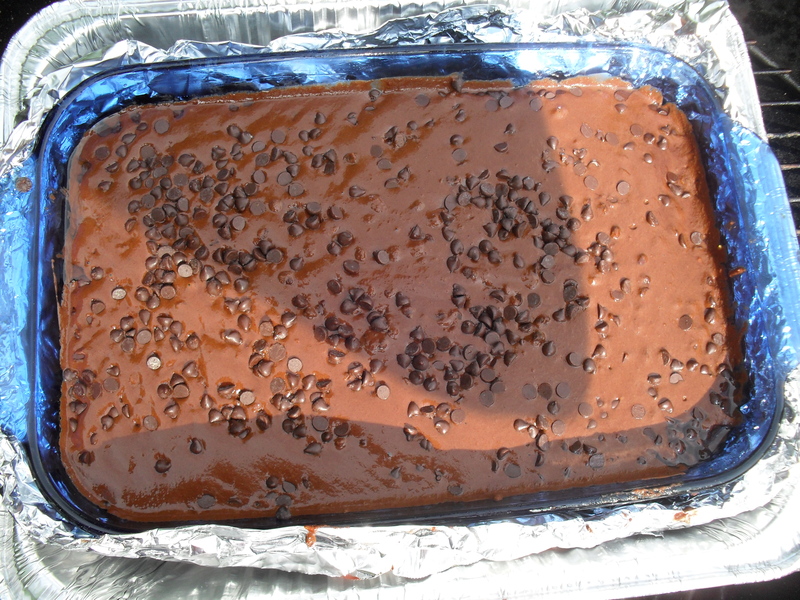 Next I set up the pan…I am not sure if this is paranoid or genius but I put a 7×11 Pyrex baking dish into a foil pan so that they brownies wouldn’t burn on the bottom from being directly on the heat, and so my pan wouldn’t get ruined. I know…I thought of everything! 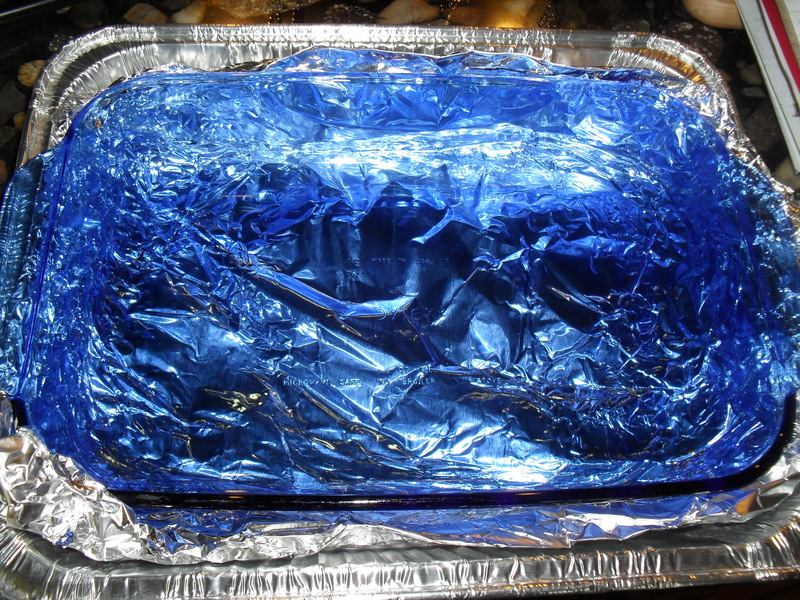 I put some foil in the bottom too, so there is actually a space between the Pyrex and the foil. Also the handles rest nicely on the edges. How freaking awesome is that? Don’t forget to lick these clean! 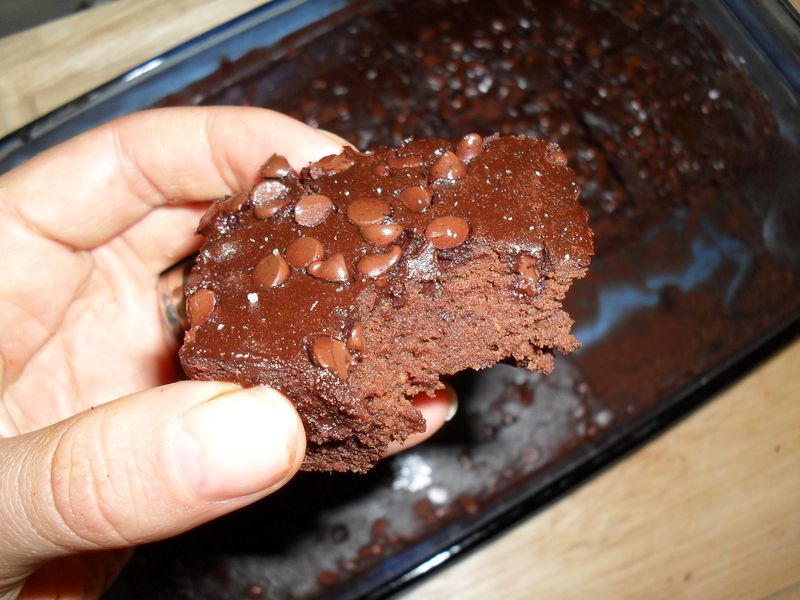 Next step is so easy a caveman could do it, I greased my pan with some coconut oil, poured the batter in and mixed in most of my chocolate chips. I reserved a few for sprinkling over the top just because it looks pretty. Before you throw these babies onto the grill, check your coals. You might need to add more to heat it up. You should be able to hold your hand over them for at least ten seconds, but they should still be hot. If yours arent add in another 1/3 of a chimney full and check the temp again. If you’re one of those a-holes that uses a gas grill then you could set it to 350 and bake for 25ish minutes. This is of course where the art of grilling comes in because they will have different cook times at different temps, you have to do the high-tech “butter knife shoved in the middle” test to see if they are done. Mine took about 35 minutes, if yours are cooking too fast on the outsides but raw in the middle you can move them off of the direct heat to finish. I suppose you could bypass this and just bake them in the oven, but if you wanted to do that you could have just found a regular recipe on a site that isn’t about grilling. 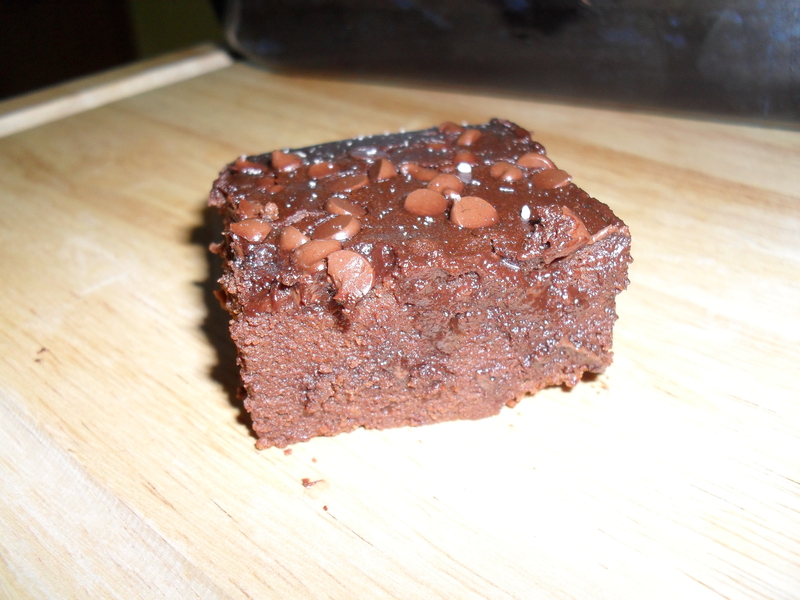 Addendum: store these brownies uncovered in a microwave or oven. If you cover them tightly they get soggy. You can of course solve this problem by eating them all in one sitting. Oh man, these look so good. Can’t wait to try them out! YES. 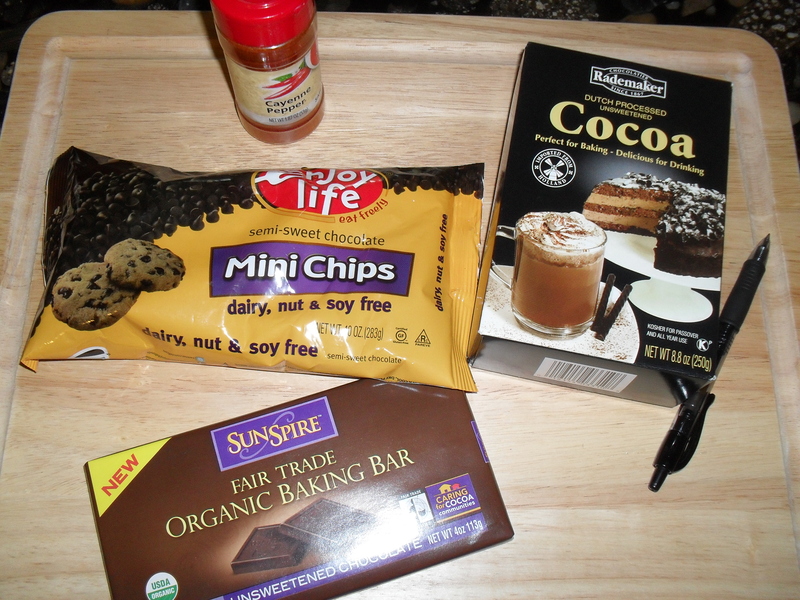 I was in need of a brownie recipe for a special occasions! DONE.